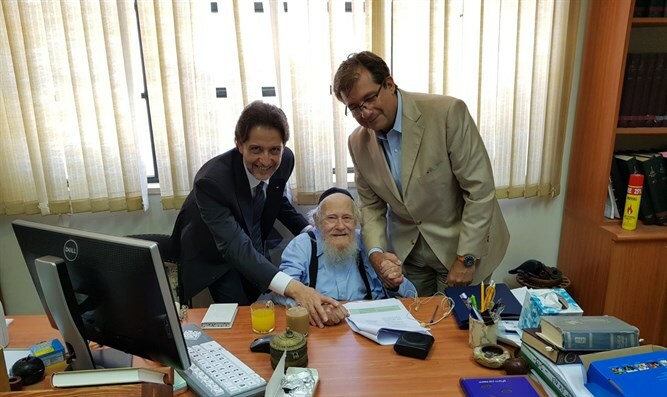 Outgoing Italian Ambassador to Israel takes leave of Rabbi Adin Steinsaltz, both parties say friendship will never be forgotten. Outgoing Italian Ambassador to Israel Francesco Maria Talo on Thursday night took leave of Rabbi Adin Even-Yisrael Steinsaltz. Rabbi Adin Steinsaltz, considered to be one of the great minds of our time, dedicated his life to making the Talmud more accessible to all Jews. He recently returned to his office after suffering a stroke just over half a year ago.